Welcome to my trip report on Vietnam Airlines and the Airbus A350! This aircraft, registered as VN-A886, undergo some flight tests before being delivered to the airline. The airline representatives and flight crew would be there to ensure all parts are working and once they are satisfied, a ceremony (for the first aircraft) to celebrate the delivery would be held. Paperworks to be completed, then the key of the aircraft would be handed over. After that, a water cannon salute for the first delivery before the delivery flight to its home base. Subsequent deliveries of other aircraft would be done quietly. This trip came about around November when I saw some good offers from Scoot and decided to go somewhere nearby to enjoy a short break and perhaps fly some domestic flights in Thailand. 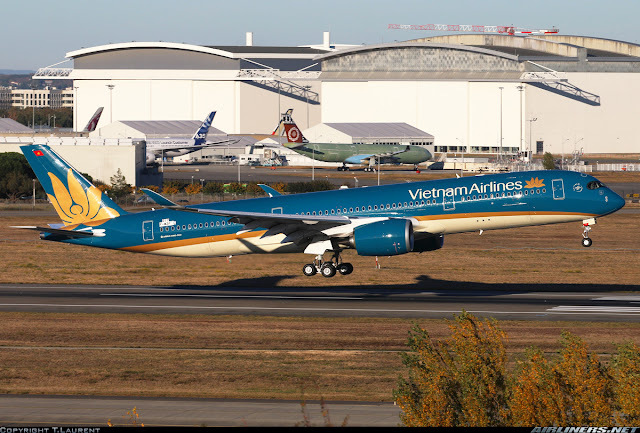 The idea of flying Vietnam Airlines' Airbus A350-900 came when I read some trip reports and also a few of my friends especially the ones on airliners.net were talking about flying the A350 with another airline, Finnair. Initially, I wanted to wait for Finnair to fly to Singapore with this aircraft type but after knowing that there would be further delays due to some issues with the interior of the aircraft, I decided not to wait and go ahead to flying with Vietnam Airlines's A350 which would be used on both domestic and international flights. Some of you must be wondering why not fly on long haul? 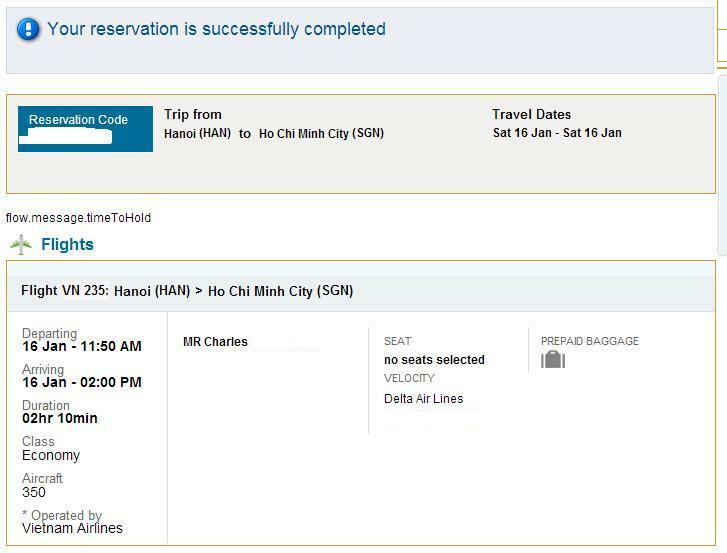 Well, I have other plans for that, such as flying Finnair's A350 to Helsinki and besides Ho Chi Minh City to Hanoi is around 2 hours of flying and that time, the ticket was very cheap, so I didn't take long to decide and before I knew it, the tickets were booked! 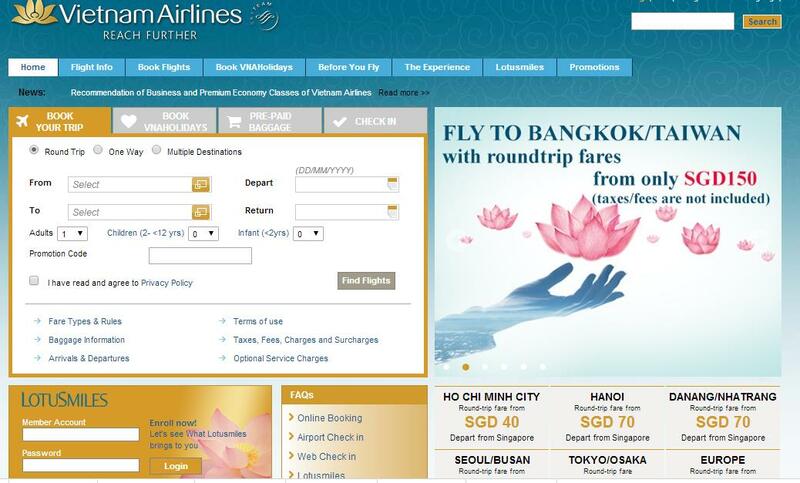 The main issue I worried about was getting last minute equipment change which happened to me before with China Airlines and Thai Airways, so every few days, I would check the airline's website and Flightradar24 hoping that things goes to plan. Fortunately, I got what I want and I can share this experience with you. I decided to save the extra bucks and fly instead on Economy Class on both ways. 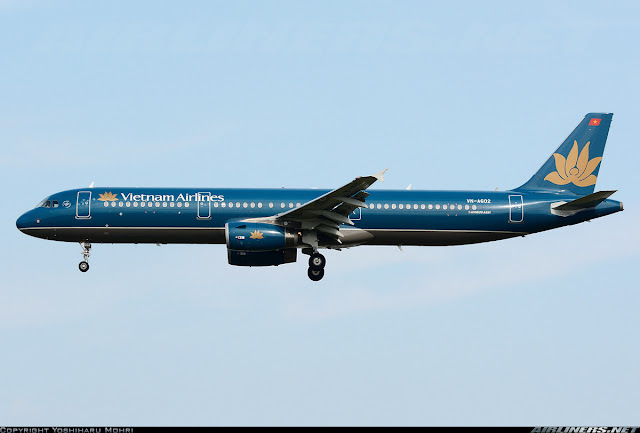 This airline is the national airline of Vietnam, set up in 1956 with its original name - Vietnam Civil Aviation. 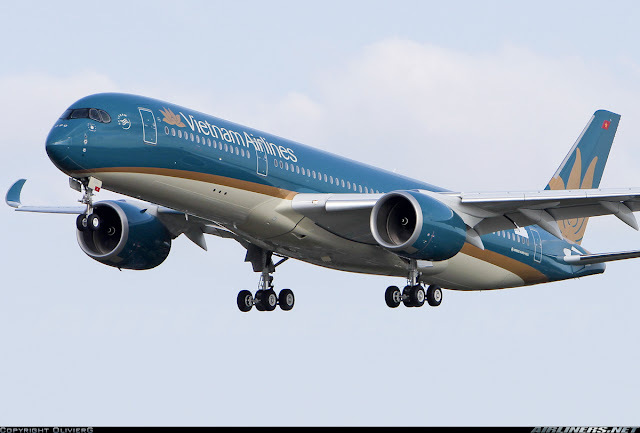 It is based in Hanoi with 2 main bases, Hanoi's Noi Bai International Airport and Tan Son Nhat International Airport (Ho Chi Minh). In 1996, the government brought together 20 companies to form Vietnam Airlines Corporation and a restructuring of this company took place 4 years with a change in management and an update with its livery (to the current) and also joined the Skyteam alliance in June 2010. Future of this airline looked bright from then on and with a modern fleet of Airbus A321, Airbus A330, ATR-72, Boeing 777-200ER and the new aircraft, Boeing 787 Dreamliner and Airbus A350-900 joining the fleet, this airline is definitely going places. The airline used to operate this Boeing 767-300ER before being replaced by the Airbus A330-200. This is the -500 series. The airline also operates the -200 series. The Airbus A350 XWB (Extra Wide-Body) is a long range twin engine aircraft built by Airbus to replace the Airbus A330 and A340 and compete with Boeing's 787 and 777. This new generation aircraft offers a wider-fuselage over the 787 and hold more capacity than the Boeing 787-8 and -9 series. 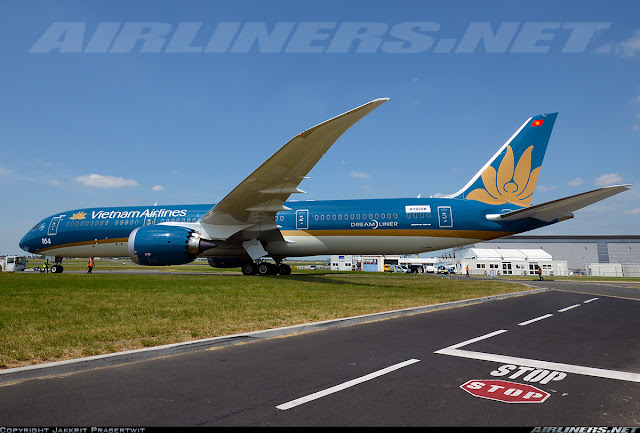 Thanks to Boeing's launch of the Boeing 787, Airbus followed suit due to pressure from the American manufacturer and customers, this European manufacturer was forced to ditch its original Airbus A350 design (Main change is the engine) and re-designed to something bigger to give a good competition to Boeing's 787 and 777. This Airbus A350 is the first Airbus aircraft with both fuselage and wing structure made by mostly carbon-fibre-reinforced polymer. Its basically lighter than the current ones which allows this aircraft to fly further and save more fuel. There are 3 types to this aircraft model: -800, -900 and -1000. The models are based on the capacity and the range. For the -800, it's performance on paper is pretty close to the Airbus A330 NEO (New engine option) - a new variant to the A330 series which was launched not too long ago and therefore this aircraft variant may not be built. The -900 series has already started flying with Qatar Airways the launch customer of this aircraft, entered service with this aircraft on the 15th January 2015. The first -1000 series (Jan 2016) is still in the building stage and would be ready to fly probably either 4th quarter of this or early next year. Only Roll Royce engine powers the Airbus A350 family. 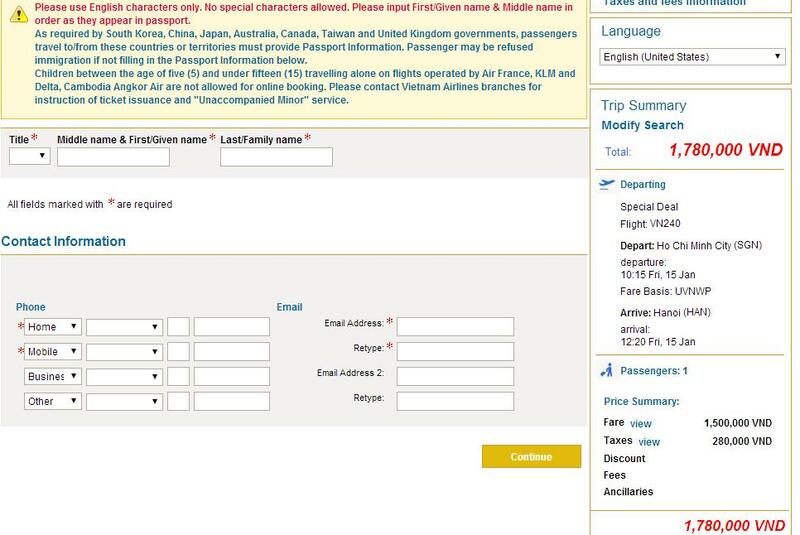 The last time I used the airline's website, it was inconvenient. Lots of functions were not available and website was pretty buggy. 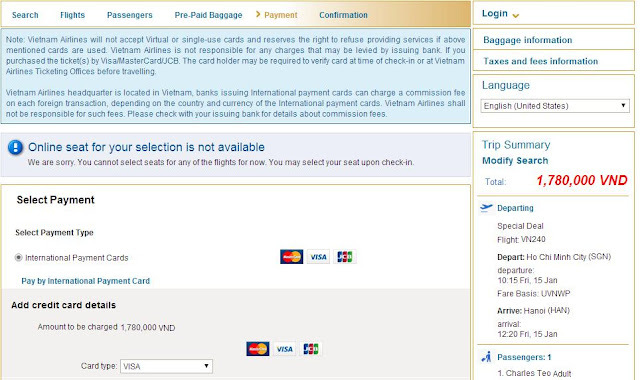 Since then, the airline updated it and after giving it a try, it was better, but still encountered problems. I had to use the mobile app in the end to do my online check in as the website wasn't Ipad-friendly as the page appeared in html codes instead of the online check-in page. 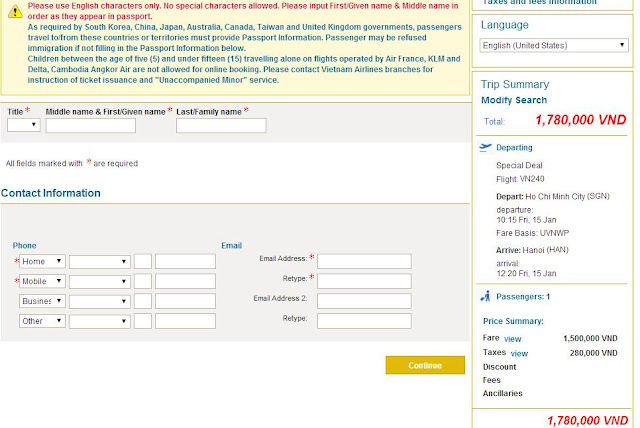 For booking of tickets, I did it with my desktop, no issues encountered. Since my ticket was a discounted one, I wasn't able to select my seat until 24 hours before departure. Looks better than before but some of the features are not updated such as the fleet information. Seat map of the new aircraft types such as A350 and B787 would be very useful. At that time, my priority was to fly on the A350 and it flew on different flights every day. So after picking the dates, I had a look at the flights which was operated by the A350. 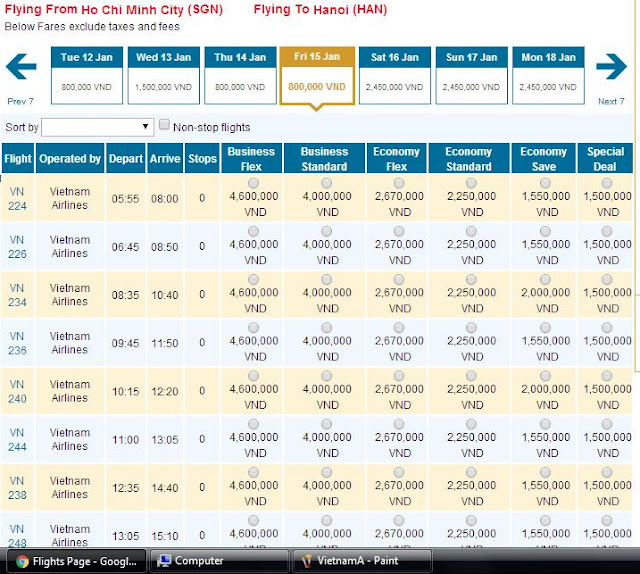 So for the flight to Hanoi, I chose VN240 and the return with VN235. I wanted to do VN239 as it was also operated by A350 but decided on a different flight number in the end. 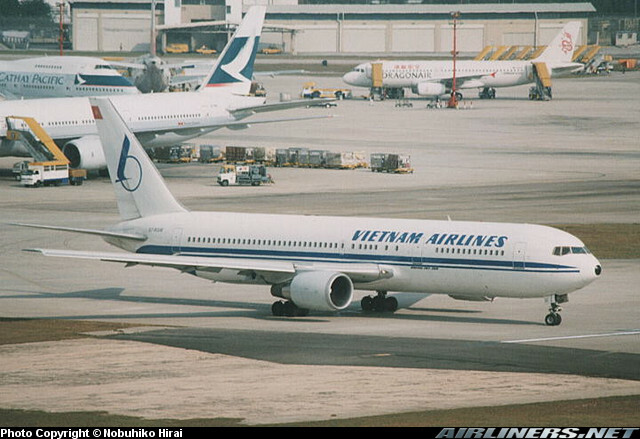 It was a good thing because VN239 that day was operated by A321! Thanks goodness. For the one way ticket, this price was considered quiet cheap. No issue with the booking, best to use the desktop version to do so. I did a one-way booking for each sector because I wasn't sure whether I was going to do SGN-HAN-SGN flight or SGN-HAN-SIN. Once I decided to do the return, I booked the return one-way ticket a few days later. After that, I just had to count down the days! I was slightly worried after what happened to me when I booked with China Airlines for the Boeing 777-300ER. Instead, I got the Airbus A330-300 and Boeing 737-800. Did a few checks as the time came closer, fortunately nothing changed and I got my A350 rides both ways. You can do so 24 hours before departure. Quite excited as I wanted to see the flight map as soon as possible and get the best seat. I was told that row 10 was one of the bests for wing and engine shot, but unfortunately the rows from 10 to 16 were occupied. So here we are at the check-in page. 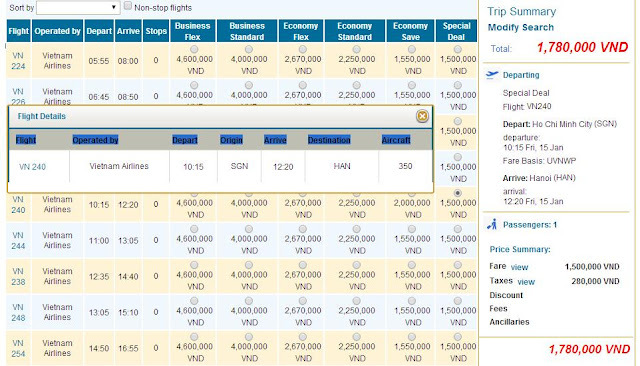 Selecting your seats will reveal the flight map and for aircraft with rows up to no. 42 in 3-3-3 configuration means it could either be Airbus A350 or Boeing 787-9 aircraft. I chose my seat at the rear cabin, row 33A was my choice for the flight to Hanoi. What's the difference between A350 and B787 configuration? 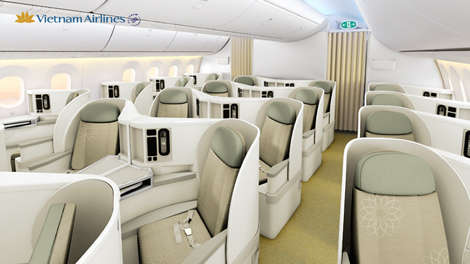 For the 787, row 41 is 2-seater and 2-3-2 seating configuration for the Premium Economy, A350 is 3-3-3. Check-in was completed. No issue with the mobile app version. I stayed at Luxury Hotel which is a 10 minutes walk from the airport, so that I could wake up a bit later and take my own sweet time there. On that morning, I received an email from the airline stating that my flight was delayed until 11.50 in the morning, fortunately the aircraft equipment was still listed as A350, so no issue with that. Good thing is I got out the hotel a bit later and made my way to the airport by foot. The email informed of a change of schedule but showed me my original departure timing so I went to the airline's website and application to check the new timing and it was changed to 11:50. The effort is there but that mistake could have been prevented. 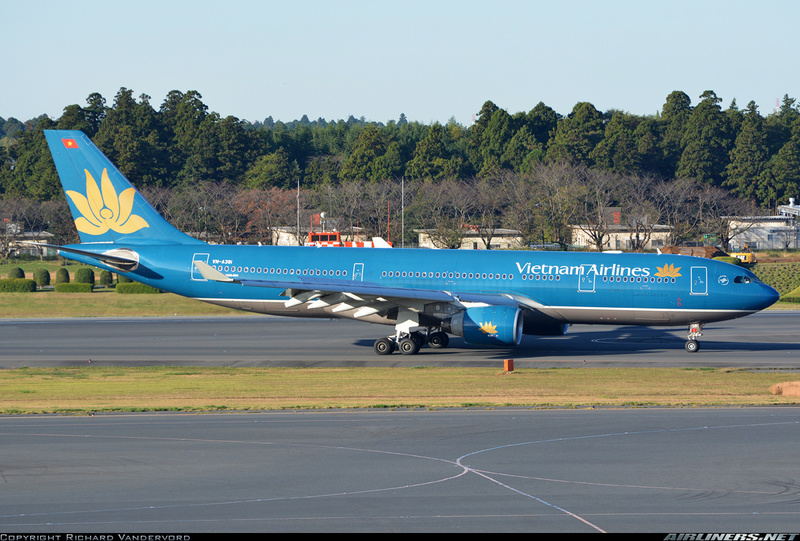 Thanks to Flightradar24's info, VN-A889 - the 4th aircraft was on her way to Ho Chi Minh City and would fly me to Hanoi. Apparently the reason of the delay was due to a technical problem with the aircraft. The APU (Auxiliary Power Unit) was the issue and since it couldn't be fixed, the airline decided to continue operating it, using the ground equipment to power the aircraft on the ground, similarly to those aircraft without APU, such as the small turboprop planes. Finally touched down and taxiing to the gate. The excitement of flying the A350 for my first time just got even bigger! Lovely weather that day as I made my way to the airport by foot. Got myself lost while walking along the road trying to figure out a way to get across. Thanks to one of the locals, I managed to find the path to the airport. Found the right way and cut through some roads to get to the domestic terminal which is about 10 minutes walk from the international terminal. There are some cafes at the land side. Travellers would be pleased to know there is free wifi available both in and outside the building. 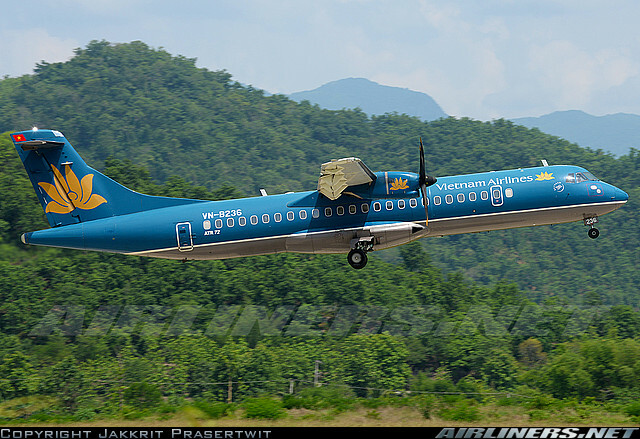 Vasco, a subsidiary of Vietnam Airlines, operates 2 ATR-72 aircraft. Jetstar Pacific's Check-in counter. This airline is also a subsidiary of Vietnam Airlines. This is where I did my check in. The check-in staff didn't seem to be in a good mood but at least she confirmed my flight's aircraft to be operated by the Airbus A350. She only broke into a smile after issuing the ticket. I had to ask because I checked Flightradar earlier on, a Boeing 787-9 Dreamliner was flying behind the A350 on the same route. I love the 787 but flying the A350 was my priority. After collecting my boarding pass, I made my way to the air side. The counter staff also reminded me of the change of flight schedule. Off to the security check, not difficult to find. This leads to the air side, just finished security screening and passport/air ticket check. The air side is quite big with lots of shops and restaurants for you to choose from. After my lunch, I heard an announcement for passengers of VN240 flight to head to a certain restaurant for free meal - I thought that was a great gesture especially the delay wasn't that long. Since I was full, I gave it a miss. Didn't see any charging points at the seating area, but I believe some restaurants have it, at least the one I went to. 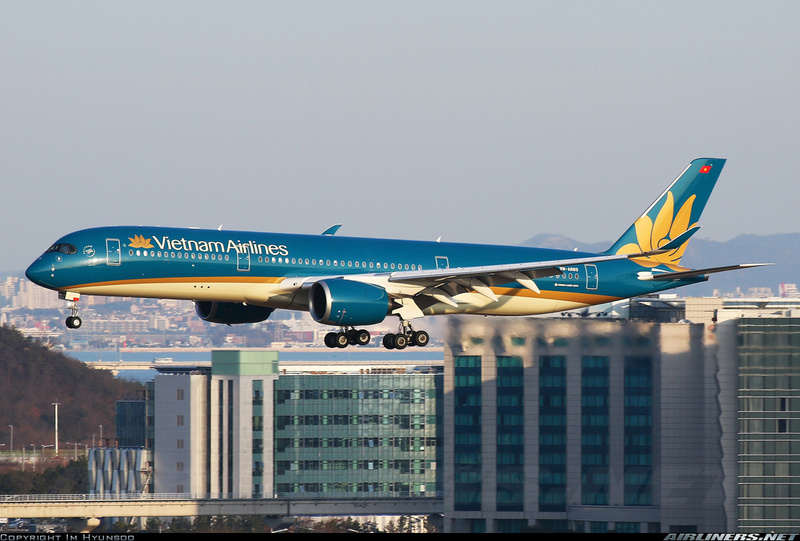 VN244 was operated by VN-A865, one of the newest Boeing 787-9 Dreamliner aircraft. The domestic terminal is quite big, with a good number of domestic flights dominated by Vietnam Airlines. This caught my attention! What do you think? Jetstar Pacific livery with Vietnam Airlines' engine cowling cover. This A321 aircraft along with another are leased from Vietnam Airlines. There are even fast food restaurants at this section of the terminal. Once I was done exploring the air side, I settled down and wait for my ride to arrive. My breakfast - costs me only U.S $4. Free Wifi! You just have to follow the instruction and you are online! No need to log in. I spotted my ride coming in. It was my first time seeing this airline's Airbus A350. Photography of aircraft at this terminal is not friendly at all unlike the international terminal's air side. I had to shoot through double glass in order to photograph my ride - VN-A889. Do you notice the vehicle just beside the aircraft? That vehicle supplies power to the aircraft as the engines are off due to the faulty APU (Auxiliary Power Unit powers the aircraft when the engines are switched off). I managed to catch a photo of the Boeing 787-9 Dreamliner at the gate. Can you see the difference of the nose between this aircraft and the A350? Before boarding started, there was already a queue. Usually, I would wait for a while before joining the queue. But because this flight is significant, I was one of the first to queue up with some locals cutting queue. Its hard to describe how I was feeling at this point, its a similar, exciting feeling when I first flew the Boeing 787 Dreamliner and that honour goes to ANA's flight to Tokyo Haneda from Taipei Songshan, and you can check out that trip report over here. Boarding started around 10 minutes before the schedule departure time, I knew we would depart late. Do you know what is the circular window for? Its for the aero-bridge staff and the cabin crew inside the aircraft to communicate with each other with hand signal. At 11:41, I was on board the Airbus A350 aircraft. A selection of newspapers was available including English. Welcome aboard! However, the crew didn't seem enthusiastic as she half heartedly pointed to me where my seat was. Headed to my seat, snapping photos along the way and fortunately, the crew didn't mind, they probably are used to it. This A350 is the first twin jet wide-body with the 3-3-3 seating configuration in the Y class, so it was a bit strange when I first entered the Economy Class Cabin. The Business Class is different from the 787-9 cabin - why the difference in Business Class product? I am not very sure myself. This Business class product features Sogerma Solstys seat by EADS, I have tried it before on Hong Kong Airlines and certainly not a fan of this product. The good thing about this product is its in a 1-2-1 seating configuration, aisle access for every seat and the seat can be turned into fully-flat bed. The bad thing is the lack of privacy if you are sitting at the aisle seat and I find the space a bit cramp for my liking. The last passenger was about to leave the aircraft. As you can tell, this photo was taken after the flight. Thanks to one of the cabin crew for allowing me access to take these photos. As the crew were doing a turn around at Hanoi, I had to take the photos quickly and leave the aircraft. I asked for me a cockpit visit but the senior purser told me to next time ask during the flight as the pilots were busy doing the turn around. I like the light colours chosen by the airline for this Business Class product, matches with the crew's uniform. Windows for every seat - the Airbus A350 uses the conventional window shade. The cleaners had started their job which meant I had to make my way out. So what do you think of the business class product? This is definitely not new. Some of the airlines like Thai Airways, Emirates and Hong Kong Airlines also use this product and you can check out my experience with this Business Class product over here. In my opinion, I prefer this product. 3-3-3 configuration same as Economy. By looking at these photos, its hard to tell the difference. 45 seats altogether with better legroom space than Economy Class. If you like engine view, choose the premium economy class cabin. Do you notice the legroom space? Its wider than Economy Class. IFE screen looks good and is definitely an upgrade over the older IFE system. 5 Rows of 9 - 45 seats in the A350's Premium Economy Class. I wonder why the airline uses 2-3-2 for the Premium Economy Class on the Dreamliner aircraft and not this aircraft. More details on the airline's 787 Dreamliner product to come in the near future, probably would do the same route: SGN-HAN and return. This cabin features 3-3-3 seating configuration with 231 seats altogether. Legroom space is tighter but along with the Premium Economy, the seat width is 18 inch type making it more comfortable for passengers. 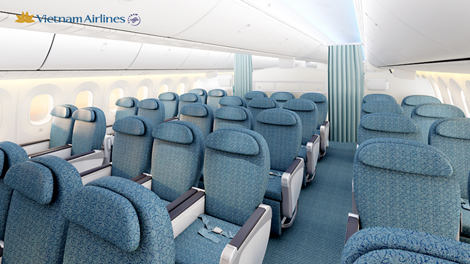 The Boeing 787 has a narrower fuselage width but uses the same 3-3-3 seating configuration, can you feel the difference? Well, I did and I find the A350 more spacious. The emergency window seat row provides ample legroom space. The rear of the cabin - it turned out to be a full flight. I was glad to be able to board early. The seat pitch is pretty tight, around 31-32' inch. So paying more for the Premium Economy on long haul flights may be worth it. This was my seat, row 33A. The Airbus A350's window is definitely smaller than the 787 Dreamliner. The 3-3-3 seat layout is quite comfortable on the A350, hopefully no one has the idea to configured this with 3-4-3, that would be quite uncomfortable. The seat itself is not bad, quite comfortable and I find the seat colour quite matching to the airline's livery. This photo was taken during the flight. New Cabin Interior from Airbus, what do you think? All I can tell you is how quiet the cabin was during cruising. I certainly like the new Airbus cabin, an improvement over the older ones. Finding it to be more roomier and pleasant to look at. You can either use the buttons here to switch on the light or the remote control. The interesting LCD display for the warning signs, I like it. I don't think the 'No Smoking' sign is needed. Just paste a sticker somewhere since smoking has been prohibited for quite a while. Fasten your seat belt whenever you are seated! There should be a drink holder instead of having to open the tray folder. Large enough to place your laptop on it for some who wish to do their work. The conventional window shades which Airbus decide to continue using on this new generation aircraft. Took a few quick shots of the crew's work space at the rear. A small party could be held over here during the long haul flights! I had a little difficulty locking this door, had to use a bit of force. The cabin crew in general were not enthusiastic; the lack of warmth from them was quite obvious. There were more crew than usual to train the newer ones and also for them to gain more experience on this new aircraft. This aircraft's cabin is newer and different from the Airbus A330, so it might take a while for the crew to get used to. I find the service on the overall to be average, even with the flight purser who I asked for a cockpit visit seemed to be quite moody. Perhaps they were stress? Still, some friendliness and smiles on their faces would be great. This is also another issue the airline could work on - in-flight service on all classes. My previous flight experience with this airline, I had this similar problem. Even though the schedule time was 1150, we pushed back later due to the extra time needed to start up the left engine, disconnecting the power from the aircraft to the vehicle (faulty APU) and moving the vehicles and cones away from the aircraft. By the time we were ready, we were 10 minutes behind schedule. Once clearance was given, we pushed back with the second engine starting now up shortly after. It was quite a quiet affair unlike the GE-90 engines powering the 777, would shake the whole aircraft and "announce to the world" that it is going to depart, but I enjoy it. During the engine start up, safety video demo was played and soon the crew came around to do the mandatory safety checks before take off. The Captain gave us a welcome speech and some information on our route before the crew repeated it in both English and Vietnamese. The sound of the flaps being deployed was quite loud (you can check it out on my video in the later part of the trip report) and once we were at runway 07 threshold, we were 2nd in line and soon we were off. The take off was powerful and very quiet. We lifted off effortlessly and headed to our assigned Flight Level. Seat belt sign was soon turned off and I got up to take some photos before setting down for the rest of the flight. The IFE system was available for use only after take off, but ear piece was not provided so most of us had to watch our programmes without sound. However, you can use your own to listen to music. I tried using mine, no problem. Most parts of the flight were smooth, except passing through some clouds. In-flight meal service was normal. Captain updated us with the weather in Hanoi and soon after, we started our descend into Hanoi and landed on runway 11R, taxied to the gate. At the gate, the crew explained the problem to us about the faulty APU and it would take a while before we could disembark. So, once at the gate, the left engine was kept running until a ground vehicle hooked up the cable onto the aircraft, providing power for it before the engine was turned off. Only then, the aero-bridge could connect to the aircraft's door. Only one door was used so disembarkment of all the passengers took quite a while. As for the cabin and flight crew, they had to do the return flight, so it was a bit of a rush for them preparing the aircraft once the passengers left. This touch screen size is just right for me. You can either use the touch screen or the remote control below. Using the torch screen is not an issue. There is a USB port and the earpiece connector for every passenger including the bulkhead rows which are located at a different place. 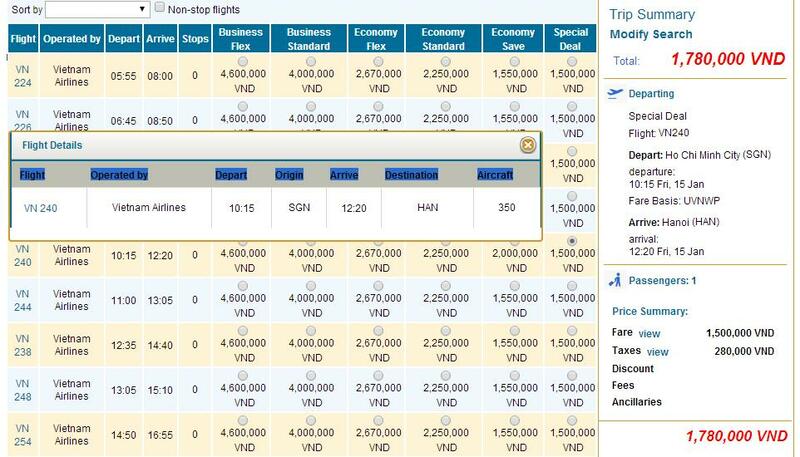 Its nice to have seat row number and flight information on this page. A small selection of the recent blockbuster movies. For my flight duration, there wasn't enough time to catch one, as the duration of most movies are around 2 hours. The Skymap - it was pretty basic. You can't do much except to wait for the page to flip to the next. About the airline's fleet. Do you know what aircraft is the picture showing? Once I was done with my exploration of the Airbus A350 Economy Class cabin, I settled down to watch the 'Greatest 150 goals' which lasted 25 minutes. I would be disappointed if I was flying on another aircraft type. Boeing 787 would not be so bad but for the others such as the A321, A330 and B777, I can't say the same. 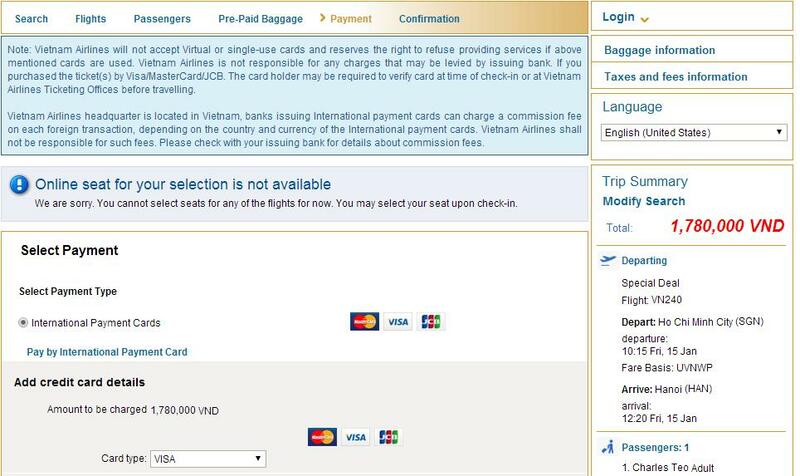 "Thank You for flying with Vietnam Airlines, we hope you enjoy our service!" There are also destination videos to feed you with some interesting information, and its worth checking them out. This aircraft and perhaps the 787 Dreamliner don't have cameras installed for passengers to view outside. Unfortunately, the Wifi wasn't turned on on this flight. I couldn't try this service, perhaps it is only turned on for international flights. Chicken noodles - it was not bad to be honest. For a domestic flight, this was acceptable though I would prefer if they add in bread together with this meal. I had a choice between Coke or water, I chose the latter. Coffee and Tea service was available, I chose a cup of coffee with sugar. The new type of winglets and I have to say I like it a lot! EVA Air's Boeing 777-300ER and China Airlines Boeing 747-400F parking at the remote parking lot. The residents living in those block of flats can enjoy some good view of the aircraft passing by. I guess they are used to the noise by now. There is even a golf club nearby, hopefully no one has the strength to hit the ball so hard that it strikes a passing by aircraft. On the runway, waiting for clearance for take off. Take off was slightly bumpy and its always the case on my departure flights from this airport. Air was smoother then and we continued to climb to above FL 100 before seatbelt sign was turned off. Enjoying every minute of the A350 experience. Did I mention earlier how quiet the aircraft is? The take off, cruising and the quietest part is the landing. Comparing to the Boeing 787 Dreamliner, this aircraft is the winner. Soon, it was time for landing. Apart from the noisy flaps, the cabin was quiet. Conversation from others just a few rows behind mine could be heard. Even one of the passengers besides me was commenting about it. We had a bit of bumps here and there especially flying through the clouds, but nothing bad. Soon we were out of the clouds. Once we were around 3,000 feet, landing gear was out and we were on final approach to Hanoi. Traffic was light at that time so we were cleared for landing without the need of circling around. Touched down smoothly on runway 11R and we taxied to our assigned gate. New aircraft ride to a new city for my flight log book. I can't ask for more, maybe better weather in Hanoi would be nice. It took a while before we could disembarked. Photos of me taken on board VN-A889. 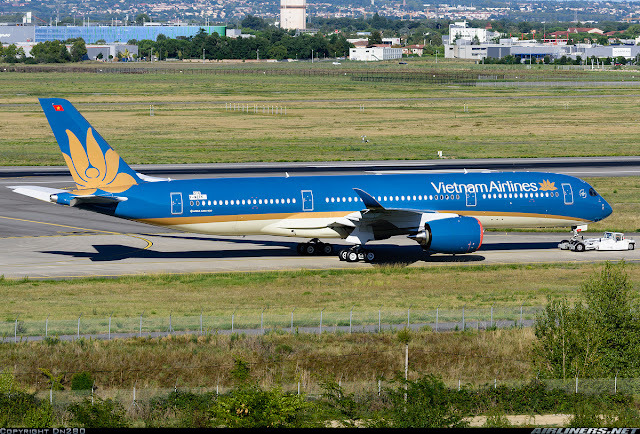 Thanks for the ride, VN-A889! Making my way to the arrival hall. Without a check-in luggage, I was able to save some time. A short walk to the arrival hall, it took less than 10 minutes. This is the arrival hall. I met the hotel representative who drove me to the hotel. This is the domestic terminal, the international terminal is about 10 minutes walk from here. More photos of Hanoi domestic terminal in my part 2. I was relieved to see the Airbus A350-900 at my gate. 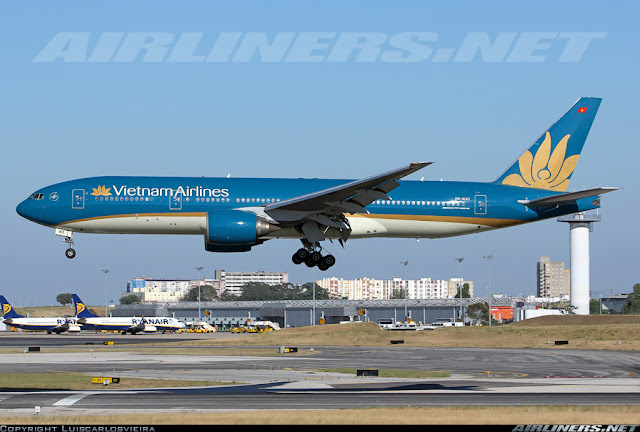 Without a spare aircraft and if the airline decided to go ahead with the original schedule, my aircraft would probably be changed to another type, possibly the Boeing 777-200ER. So for the change in flight timing, I won't include punctuality in my rating. This airline has finally gotten itself a competitive product; both hardware and software products are way better than the old ones. Not the best cabin products, but they are not bad maybe except for the seat pitch in Economy Class. Apart from that, its nice to have a feel of the A350-900, a quieter aircraft over the Boeing 787. Both aircraft have their pros and cons and I will do a blog post on this in the near future. In-flight service wasn't very good, and I feel ear plugs should be distributed to allow the passengers on this short flight to sample the system so that may encourage them to fly long haul with this carrier. The in-flight meal was pretty decent and for the price I paid, it is a bargain. An overview of the A350 experience would be done in part 2 (HAN-SGN). Another Good One Charles. Any idea what the IFE was, Thales or Panasonic. Clive: IFE is powered by Panasonic.